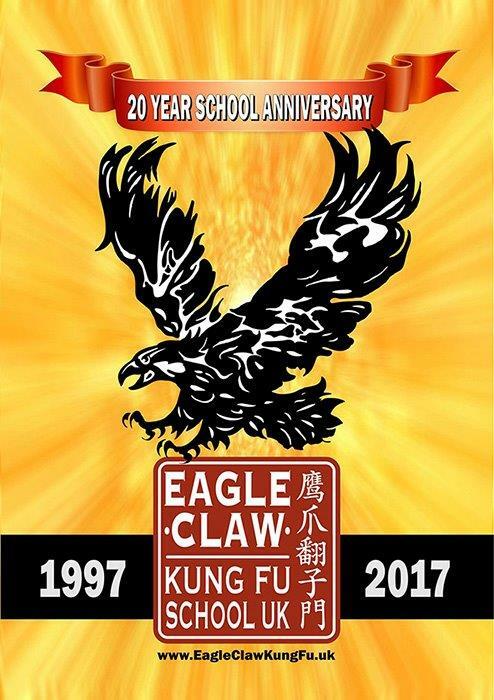 On Saturday 28th October 2017, the Eagle Claw Kung Fu School UK celebrated it’s 20 year full time school anniversary, with over 100 people attending including 15 kung fu masters plus their students. A Lion dance with 3 lions performed by the schools team kicked off the event, followed by kung fu demonstrations by visiting guests and teachers, styles represented: Eagle Claw Ying Zhua Fan Tzi Men, Bak Mei White Eyebrow, Fan style Ba Gua, Lung Ying Dragon style, Northern Mantis, Tai Chi, Indonesian Kuntao, Lohan Shaolin, Northern Shaolin Temple style , Lau Gar Kuen, Jing Wu Association from Malaysia, Wing Chun, Southern Mantis. This was followed by speeches and then a buffet of food and drinks. The director of the school Julian Dale Shifu, opened the his first full time centre during 1997 near Boulters lock, Maidenhead in a small industrial unit of 1,000 square feet. 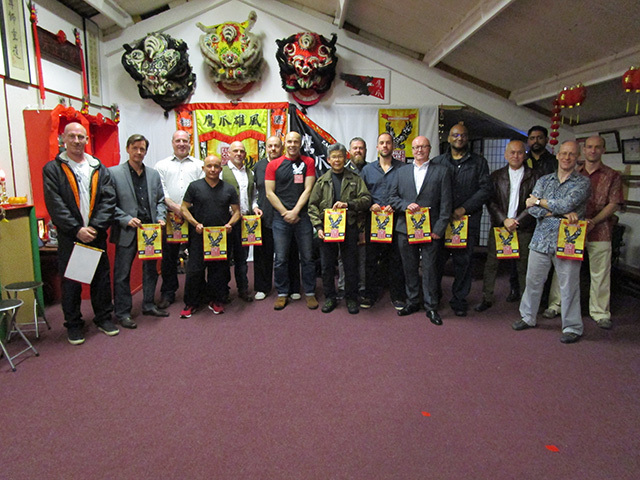 Staying there for 6 years before moving to a larger premises in Portlock road of 2,500 sq ft.
Over the years many hundreds of students have passed through the kung fu school doors, some leaving to go to university, get married, have children. In fact some of those early students are now bringing their children to learn from Shifu Dale. 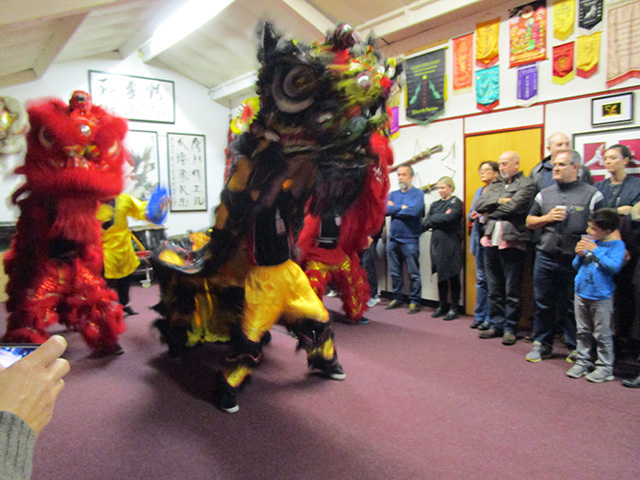 The school has become a renowned fixture in Maidenhead, with our lion dance team performing every year in Maidenhead town centre for Chinese New Year. 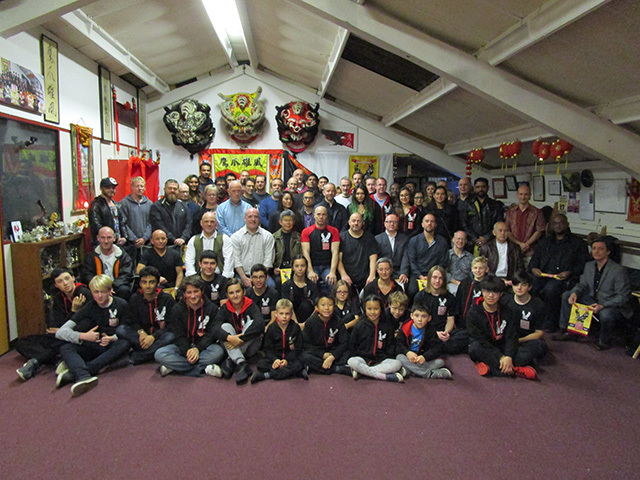 Over the years the school has made trips to Hong Kong and China, also bringing many visiting masters of kung fu for seminars and cultural development. There are extensive links to Hong Kong and China, and very high standards in teaching and student development. The school has gone on to attract students from Crete and Germany; who also now teach in their own countries, under the tuition and guidance of Shifu Dale. The school is open 6 days a week with classes for children and adults in a fully equipped traditional Chinese training hall. A unique and vibrant experience to learn within, taught with a deep passion and dedication to keeping the classical Chinese martial arts alive in today’s modern world.